11905 Private Wilson Million, 2nd Battalion, the Durham Light Infantry was killed in action 9 August 1915 and is commemorated on the Ypres (Menin Gate) Memorial, Belgium,  the Etherley War Memorial and on the Roll of Honour, St. Cuthbert’s Church. He was 32 years old, married to Betsy and had 2 children. 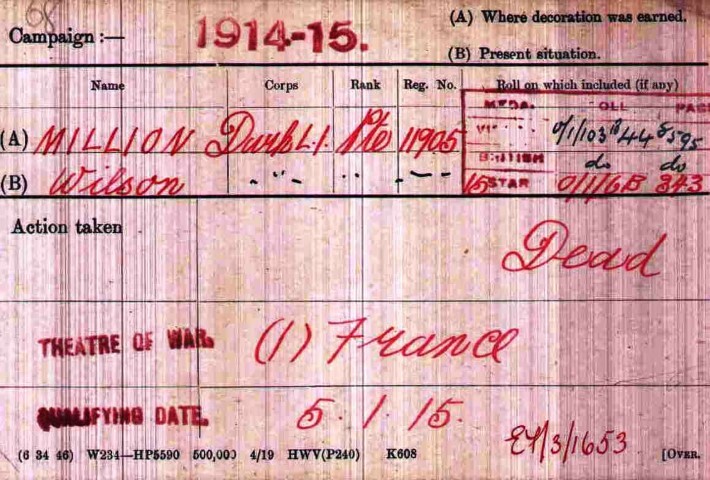 5 January 1915: Private W. Million entered France  so he did not see action at Aisne and Armentieres. He probably was in the line on the night of the 31 May/1 June 1915 when the 6th Division took over its new front in the Ypres Salient. At this time the 6th Division formed part of the V Corps of the Second Army when the First and Second Armies were bearing the brunt of the fighting along the British front. The coming of June 1915 brought a comparative lull along the southern British front until the middle of the month. However a new German weapon – incendiary rifle ammunition was introduced. The Division stayed in this sector until the end of July 1916. Trench casualties doubled immediately – battle casualties during the whole period amounted to 10,938. The British Army was still small and woefully under-gunned but increased French pressure led to it playing an increased role in offensive operations. “It was a day which the honours fell to the guns and the junior officers and men. Where many units distinguished themselves it is perhaps invidious to single out one for special attention but it is impossible to record this episode in the epic of Hooge without emphasizing the part played by the magnificent battalion to whom fell the honour of assaulting the centre of the position about the crater across the Menin road, close to the ruins of the chateau. The 50 yards which lay between them and the crater was on the rising ground and crossed and re-crossed by shattered trenches of previous positions, ploughed into holes by shell-fire, encumbered with dead bodies as grisly reminders of earlier fights, sown with barbed wire entanglements and commanded by machine-gun fire from German strongholds. Without the preliminary bombardment and the continued protection of the guns it was impossible that any man could have covered that journey and lived. The battalion made sure of its ground in the dark before the moment came to charge by deliberately working its way to the very edge of its own protecting curtain of fire risking annihilation in the event of the slightest mistake of the part of our gunners. Thus when the curtain was suddenly lifted the men were well within striking distance of the enemy’s positions and the rest for the time being was comparatively easy, thanks in no small measure to the battalion’s bombing parties, who accounted for most of the Germans still holding out. It was while commanding these bombing parties that Temporary Second Lieutenant Kenneth Storey of the 2nd Durham Light Infantry – the awards for Hooge now permitting us to mention this gallant battalion by name – won the Military Cross. Lieutenant Sopwith’s two other brother officers to receive the Military Cross for their coolness and fine example throughout this action were Second Lieutenant Leonard Scott Briggs and Second Lieutenant George Ivan Wiehe. Going into trenches at Hooge on 5th Aug. CAPT. D.L. BRERETON (2nd in command) & LT. W.D. POTTS (Cmdg A Coy) were wounded and LT. J. KENTCcmdg C Coy) was killed. The battn took over trenches from the 14th Divn & made preparations for an attack on the ground in the vicinity of the CRATER and the STABLES at HOOGE. A full account of the engagement is attached. Private W.L. Million was awarded the 1914-15 Star, the British War and Victory medals. Private W.L. 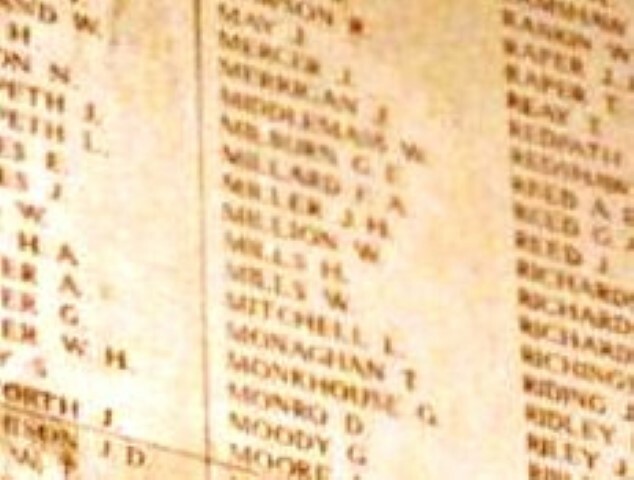 Million is commemorated on the Ypres (Menin Gate) Memorial. The Memorial is situated at the eastern side of the town on the road to Menin (Menen) and Courtrai (Kortrijk). The Menin Gate is one of 4 memorials to the missing in Belgian Flanders which cover the area known as the Ypres Salient which stretched from Langemarck in the north to Ploegsteert Wood in the south. The Salient was formed during the First Battle of Ypres in October and November 1914.